In downtown Portland, before the vegan strip mall was even conceived, was Veganopolis. Veganopolis was a cafeteria-style vegan restaurant. You would walk down a buffet line and fill your plate then weigh it and pay per pound at the end. Despite the casual setting, the food had twinges of haute cuisine, while still being, always, comfort food. The chefs, David Stowell and George Black, came from the finer dining scene, supposedly even catering for the Gores before Al became vice president. To pay $5 for a plate of their enchiladas or bread pudding was a treat. I often tried to make the delicious meals that I had at Veganopolis at home, with varying success. I attempted them from memory, asking questions now and then as I ordered my food. Eventually, the restaurant closed and David and George moved back to Chicago. Their closing was bittersweet for me because they left with a promise, that a cookbook would be published soon. I waited for two years, occasionally checking Amazon to see if it existed yet. After a while, I stopped checking, then on my birthday I was surprised with a copy of the newly published cookbook for my birthday. 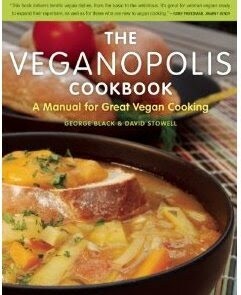 The Veganopolis Cookbook, finally! I was thrilled to see that many of favorite Veganopolis recipes were inside. Finally, I would have the secret of the almond pate and their mac and cheese, the vegan mac and cheese that I use as a standard for others. As I started cooking, however, my enthusiasm was tempered. Some of the recipes, like a Cream of Broccoli Soup, were bland. Others, like my dear almond pate, turned out to be complete disasters, probably because I didn’t have the “masticating juicer” that they suggest using. It seems clear that many of the recipes were the restaurant dishes I had been craving, but just poorly converted for a home cook. Maybe I am just a poor home cook. Maybe I haven’t tried the right recipes. More likely my attempts just don’t match the meals of my memories which are made brighter by nostalgia. This entry was posted in Cookbooks, Reviews, VeganMofo and tagged American, cafeterias, cheeze, Portland, vegan, veganmofo2013, vegetarian. Bookmark the permalink.